Our futons are made from northern white cedar, and finished with a clear lacquer finish to protect and bring out the natural color and characteristics of the logs. Sturdy, and durable. A special metal spring is used to enable them to fold out into a bed. The price listed does not include the mattress. Chair futons include a matching ottoman. Sizes are chair, full, and queen. The chair futon is made to use the same cushions as our living room chair. The full and queen use standard sized futon mattresses. We do not sell the mattress at this time because it is much more cost effective for customers to purchase them locally, rather than pay shipping costs. We do sell futon covers with rustic themes, and we are in the process of updating our fabric selections. 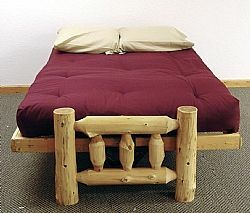 Cedar Log Futon in three size: Chair, Full and Queen. Simple and easy to convert to a bed and fold back up into a seat. We can provide covers in any of our fabric offerings.